Air Shutter Opening Full Open | 1/8"
* Please Note: This item requires the Insert Surround. The Empire VFP20IN73LN Innsbrook Vent-Free Fireplace Insert is a zero clearance fireplace insert that offers 20,000 BTU of natural gas heat output at a 99 percent efficiency. 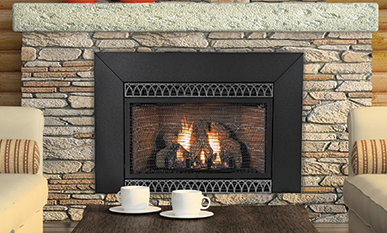 This fireplace insert can either serve as a stand-alone, zero clearance fireplace, or it can be inserted into an existing fireplace as an instant upgrade or conversion to natural gas. This small insert includes an oxygen depletion sensor designed to minimize the risk of an accidental fire, and it comes with realistic looking hand painted ceramic logs and a brick liner that give this the look and feel of an authentic wood burning fireplace. How many square feet will this heat? Will this unit run off of a 40lb propane tank? This model will easily heat 500 square feet, so long as the space is reasonably insulated and you have standard 8' ceilings. For tank size, I recommend that your LP supplier advise you further as this will have to be approved locally. To satisfy warranty requirements, a qualified installer must perform the installation, rigid gas fittings must be used and the tank must be stored outside and the placement of the tank will depend on the tank size, traffic, distance to property lines and local codes, etc. While smaller tanks are typically not recommended as they will cause frequent appliance outages when the level of propane decreases or when the outside temperature drops.